I personally think that this road is an unnumbered spur of the A1(M), in a similar fashion to the exit off the M1 for Luton Airport - on the M1, there is junction 9, but at the end of the spur, the roundabout is numbered junction 9A. Similar with the turn-off on the M23 for Gatwick Airport - the sign on the motorway says "Gatwick Airport (A23)". 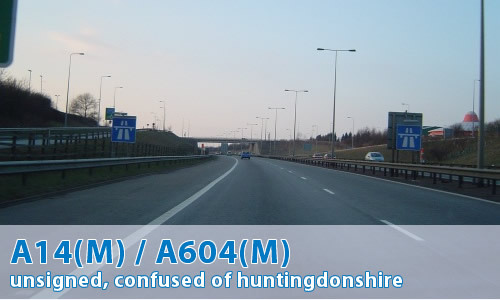 It should be called the A604(M) since the A14 goes over the A1 at Alconbury and on towards the M6. It is not officially a motorway some may call it a spur of the A1(M) or a spur of the A604. In my AA 1998 road atlas, bearing in mind it predates the upgrading of the A1 at Alconbury, I looked at the layout of the roads in the vicinity of there, only to discover that the A14 was the road I knew from the M6 to Felixstowe, with the confusingly numbered bit just east of the A1 shown as A604. I checked my 2000 edition, and it's changed to A14 there, leading up to the A1(M) spur of indeterminate number. That's a botch! I therefore have to agree with Robert Herniman that this motorway is the A604(M), or at least it should be! Back in the late 1980s, this (Alconbury to Godmanchester) *was* the A14, which left at Godmanchester to go towards Royston along the present A1198. The A604 took the present route of the A14 from Godmanchester to the A6 at Kettering. I remember even then, the A14 (A604) was confusingly signed from the A1. Strangely enough I was wondering what this bit of motorway was called when driving along it the other week. After the current A14 was built, but before this stretch of the A1 was upgraded to motorway, the A604 was a secret A road, or so I've been led to believe by a traffic engineer I spoke to at a party at the time. The link road between the A14 and the A1 was the only part of the former A604 that retained the A604 designation. Yet the A604 appeared on no signs, and (almost) no maps -- presumably the aforementioned traffic engineer had seen one. Purely for purposes of keeping the road number in the correct zone, I think the A14(M) number is more appropriate. However, I'd rather the whole spur of the A14 be renamed to avoid confusion with the mainline of the road. A141/A141(M) anyone? The current M11 ends at the Girton interchange, just north of Cambridge. The A14 from there to Huntingdon could be upgraded as a (much needed, long overdue!) four-lane M11/A14(M). Where these two split again at Spittals interchange, the section north to the A1 could be upgraded, renumbered as M11 (thus removing the related oddity of having the A14 signed on 3 out of 4 exits at Spittals)... and this proposed M11 extension would neatly include the 1.5 mile existing stretch! Three of the four exits from junction 23 are shown as A14, surely this is a nonsense to start with as a single road can't go in three directions. I suggest that the orphan is the section to the A1(M) which would do well to keep its former designation of A604. The secret motorway in question would then most sensibly be named A604(M). Here is a link to Highways Agency scheme for the A14 between Ellington & Fen Ditton. N.B. some of the files are huge! As you say on your site the special road order calls it the A604(M). Unless there is a subsequent statutory order to amend the special road order then legally it is the A604(M) whatever the signposts and HA say. This also makes the A604 an A road that is motorway over its entire length! I was responsible for signing the A14 in 1991 for which was Contract 9 of the Catthorpe to Spittals dualing of the old A14/A604. I noticed that the "Alconbury Spur" had no route number. I couldn't be the A1 as that was at Brampton and we couldn't have three A14's coming off spittals interchange. I asked the then DoT what they wanted to do about it and they decided that no action was the best action. Therefore I think it was signed (A1) and (A14) depending on where you are coming from. Incidentally to all intents and purposes it is refered to as the A14 by the HA today. I was just browsing the Highways Agency website and came accross the following on the A1(M) Alconbury to Peterborough project page, "The overall length of the project road is 21km, of which the 13km section between Alconbury Interchange and Norman Cross is dual 4 lane motorway, with the remainder constructed to dual 3 lane motorway, except for the short length of A14(M) which is dual 2 lane motorway. "